Heres a story for any aspiring businessman. Modican chocolate is famous. Apparently. It is made to the Aztec recipe brought here by the Spanish. But its not. 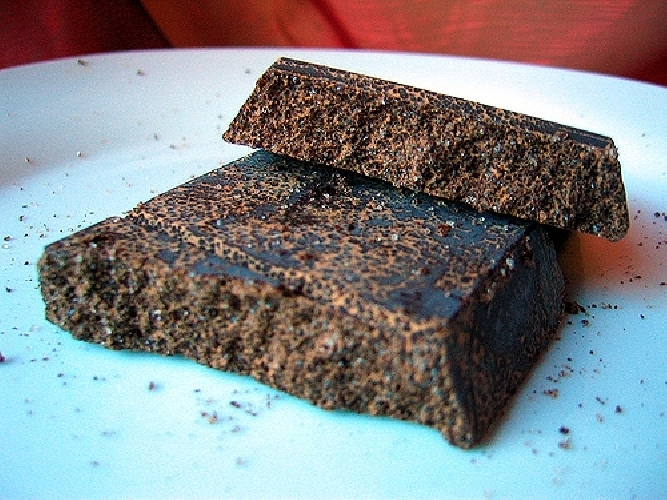 It is a chocolate made by the Modicani using a recipe brought here when Sicily was under Spanish dominion, and is a traditional folk food typical of the area. All that changed in the 1970s when one man Franco Ruta, the then owner of Bonaiuto -decided to put the chocolate making on a commercial footing. Fast forward to 2018 and Modican choclate is now IGP, and can only be made in Modica, to a standardised recipe. Now we can look inside this murky business. Twenty years ago or thereabouts, the few producers of Modican chocolate got together to form a Consortium, which lasted – as these things do in Italy – about a week, because they soon fell out. What we have now is a Consortium – the grandly titled Consortium for the Tutelage of Modican Chocolate – which is a ragtag collection of a few producers of chocolate – less than a half of the all the producers in town and excluding those of greatest success – Sabadi, Bonaiuto, and others. The consortium is nothing more than a collection of individual businesses, with an important name. It’s like calling Lidl and Aldi a consortium for the consumer with regard to quality low cost shopping. With this ersatz name The consortium has been awarded final say on all things chocolatey in Modica. As with all business the idea is to beat the competition – and it helps when you have a mayor who aligns himself unilaterally wiith a minority of producers. Since the current mayor came to office, the Consortium has opened a museum in publicly owned space and received public money. This museum is now called the Museum of Chocolate, which it isn’t, but they cant find the space to say that its the museum of the consortium and therefore shows only the history of its members. The Consortium wallows in an official status which it doesnt legally have, and accompanies the Mayor on his jaunts, makes sure than any stray VIP that happens to find himself in Modica is treated to walk around the museum and presented with a bar of chocolate. All of which is highly damaging to the other producders – not only because the Museum regulalrly gets a 1 star slating on Trip Advisor because it is, in my humble opinion, crap. With its IGP status, the Consortium now can try and inflict its values on the other producers all in best business practise and not including telling them where to buy the cocoa beans with which to make said chocolate, Nor is it imaginable that anyone wanting to rent a public space and be sponsored by a non-Consorizal chocolate producer, could receive a phone call warning them that such action would result in the availability of the public space disappearing. It would be stretching credulilty to the extreme to even think that we are reaching a point where the m word could be attached to the actions of the Consortium, or that the mayor could be guilty of presiding over, and instrumental in, unfair competition. Instead we bask in the reflected glory of an IGP mark on Modican chocolate and the fact that the president of the Consortium has, inexplicably, a pass for free parking.